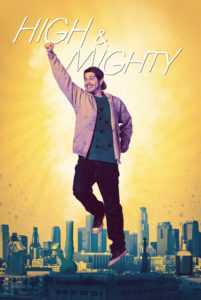 LOS ANGELES–The award winning Stage 13 scripted original comedy “High & Mighty” will premiere on HBO Latino. Screened at the 2018 Sundance Film Festival and the 2017 Audience Award winner at the Los Angeles Film Festival, the superhero comedy asks the question of its protagonist Chelo, “if you could save the world or yourself, which would it be?” After years of being perpetually stoned, drunk, and jobless, Chelo Chavez needs to get his act together. At least that’s what his girlfriend, Angie, says. After emerging unscathed from multiple gunshots delivered by a mysterious man in a flower truck, Chelo discovers that he has superhuman powers—but only when he’s drunk or high. With the help of his friends, he embarks on a mission to test his new abilities and uncover his own origin story. As he embraces his powers, the consequences of his substance abuse begin to take a toll, and Chelo must face the risk of losing the people he loves. The feature was created by breakout writer Cesar Mazariegos and rising director Carlos Lopez Estrada (“Blindspotting”). The film also stars a dynamic cast, including Jorge Diaz (“The Long Road Home,” “East Los High”), James Eckhouse “The Avengers,” “S.W.A.T.,” “All The Way,” “Beverly Hills 90210”), Shakira Barrera (“Glow,” “Rosewood”), and Chelsea Rendon (“Bright”). The premiere kicks off at 8 p.m. E.T. and will be available simultaneously on HBO NOW, HBO GO, HBO On Demand, and partners’ streaming platforms.